Millions of consumers and investors in North America are wondering how the global oil price and the price of gasoline at the pumps can be going up in the face of rising global oil inventories and no significant increase in demand for anything in the US. 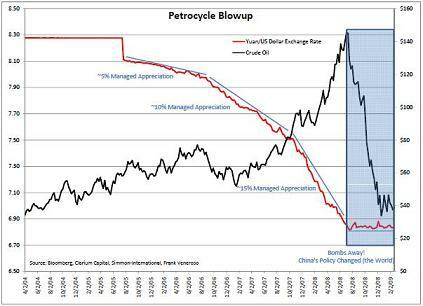 According to Philip Treick, Managing Partner of Thermopolis Partners, a large part of the reason oil and copper have been strong is because the Chinese have re-pegged their currency, the Yuan, to the dollar, since July 2008. Without a peg, the Yuan would naturally rise against the US dollar, attracting capital as one of the few growing economies in the world (as the Yuan did when it floated up between 2005 - July 2008). But an increasing Yuan was causing China to lose manufacturing jobs to other countries and cause social unrest. Simplistically, in order to maintain that peg - which means forcing the Yuan down - the Chinese must print Yuan out of thin air (just like the Americans) to buy US dollars. This increases their money supply. To offset that, they then need to sell Yuan via debt - create an obligation that is an offset to that new increase in money supply. But a couple of their debt auctions have failed recently, greatly increasing the monetary base in China. This has had the effect of flooding the Chinese banking system with capital, which has gone into new lending by banks, the stock market…and hard assets like oil, driving up growth and prices in an otherwise contracting global economy. Maintaining the peg is straining the Chinese economy - if and when something breaks, what will that mean for the oil price? It should be good for investors in oil if the thing that breaks is the peg. China pegged its currency to the US dollar up until 2005. Bowing to international but mostly US pressure, the Chinese began a slow but steady upward revaluing of the Yuan from 2005 to July 17, 2008. As this was a controlled rise, with very low volatility, investors and speculators poured billions of dollars into the Yuan to gain from its appreciation. Borrow from a declining US dollar, invest in a rising Yuan, and make 10-15% of low risk money. That’s called a “carry-trade”. Understand that the international community wanted the Yuan to rise to make Chinese goods more expensive, and hopefully other nations could get back some of the tens of millions of manufacturing jobs that had been lost to China. But as the Yuan rose, China started losing jobs to other countries, mostly in Southeast Asia. By July 2008, so many factories had been closed and jobs lost that the Chinese government made an un-announced policy decision to re-peg the Yuan to the dollar. There would be no more appreciation of the Yuan against the US dollar. THE CARRY TRADE WAS OVER. Speculators short the dollar were forced to cover as the US dollar started to soar as this trade was unwound. Fast forward to today. We see a rising oil price - usually a sign the economy is greatly improving - at a time when the world’s largest economy, the US, is still mired in deep recession. How can that be? Because the Chinese are creating billions of new Yuan to keep the Yuan low, keep it pegged to the US dollar, and some of that money must be buying oil, says Treick. 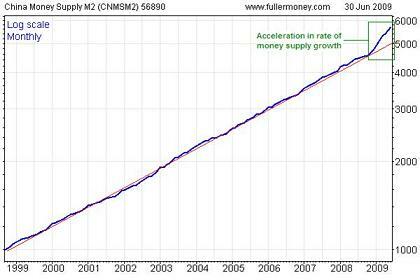 See how the money supply in China has grown since they re-pegged. This chart is from financial newsletter writer Steve Saville (speculative-investor.com-(I am a subscriber of his and enjoy his perspective)). As long as the Chinese hold the Yuan-dollar peg, billions in new Yuan will continue to be created, with much of that money flow going into hard assets like oil to hedge against inflation. This means that small, brief pullbacks in the global oil price are going to be just that - small and brief. That, Mr. and Mrs. Smith in America, is why the global oil price and your price at the pumps are going to stay high in the face of high oil inventories. Let’s not even start on the huge Strategic Petroleum Reserve (SPR) China is creating. I humbly suggest this means investors who trade oil and oil stocks strictly on the supply-demand fundamentals of the oil market - which are bearish now - will miss out on a lot of profits if they are not watching China. So how does this situation play out moving forward? Because a higher oil price is also problematic for the Chinese. They don’t want higher oil prices to kill their economic recovery. Economic unrest has already meant riots in the street in several Chinese cities. China has run a trade surplus with most of the world for many years, so they have a big enough foreign exchange reserve to subsidize the price of oil, keeping demand high in that country - which analysts say would be very bullish for the global oil price. Their other option is break the peg, which would cause the Yuan to rise quickly, making oil cheaper in Yuan. This would increase the oil price in dollars - increasing profits and stock valuations for investors. And keep the price at the gas pump high. Sorry Mr. & Mrs. Smith.